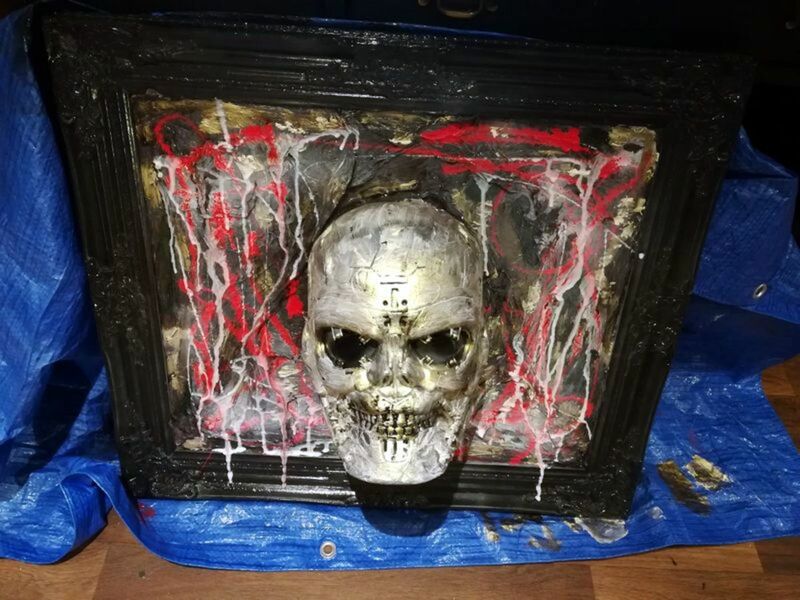 This is the 3D skull with blood and cobwebs that I made this with a picture frame, which had a mirror in it that had broken. 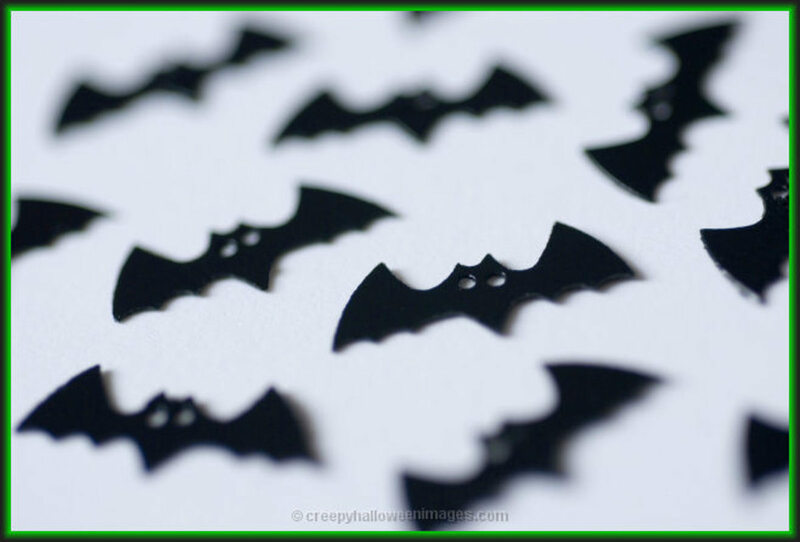 It is surprisingly easy to make and is very effective either indoors or in the front yard as part of your Halloween display. I show you how to make this with my own photos and step-by-step guide. The skull is a heavy plastic kid's mask that has lights inside the eyes that can be turned on in the dark. I bought it at a charity—thrift shop—for 50 cents. The frame had a mirror in it, which had broken. 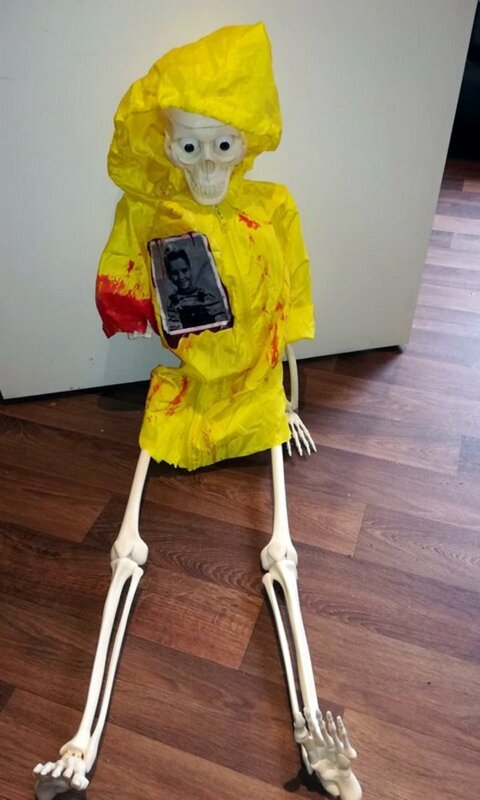 I kept it because I had seen this type of Halloween decoration last year online and wanted to make one. Clean the frame with a dry brush. 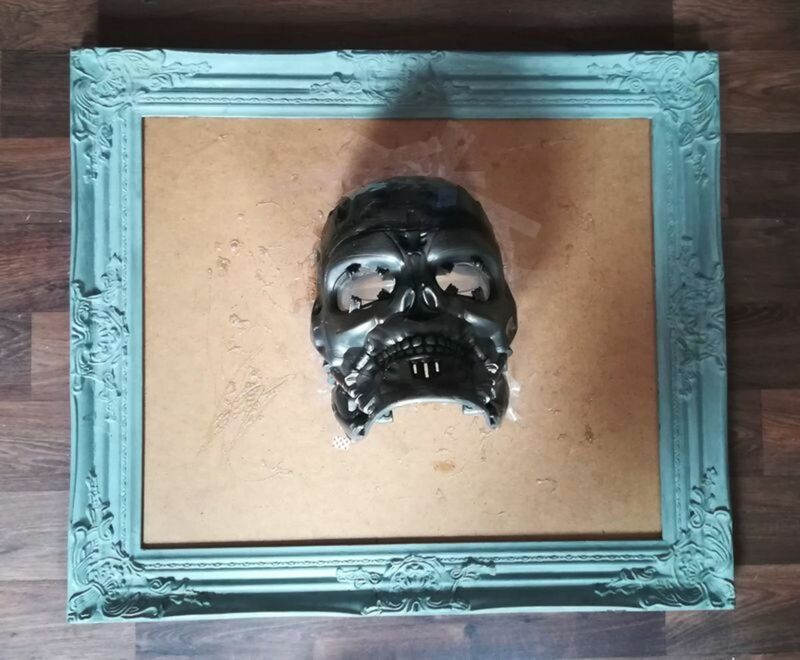 Place the skull in the middle of the frame. Mark out the outline of the skull with a pencil. This will give you an idea of where to place the glue. Squeeze the tube of UHU glue onto the pencil mark you made. Make sure to go inside the mark so you will have the maximum coverage of glue. Place the skull onto the glue and hold down for about 2 minutes. Cut out small strips of adhesive tape and place them onto the top of the skull and frame. This will keep it more secure when the frame is tilted upwards. 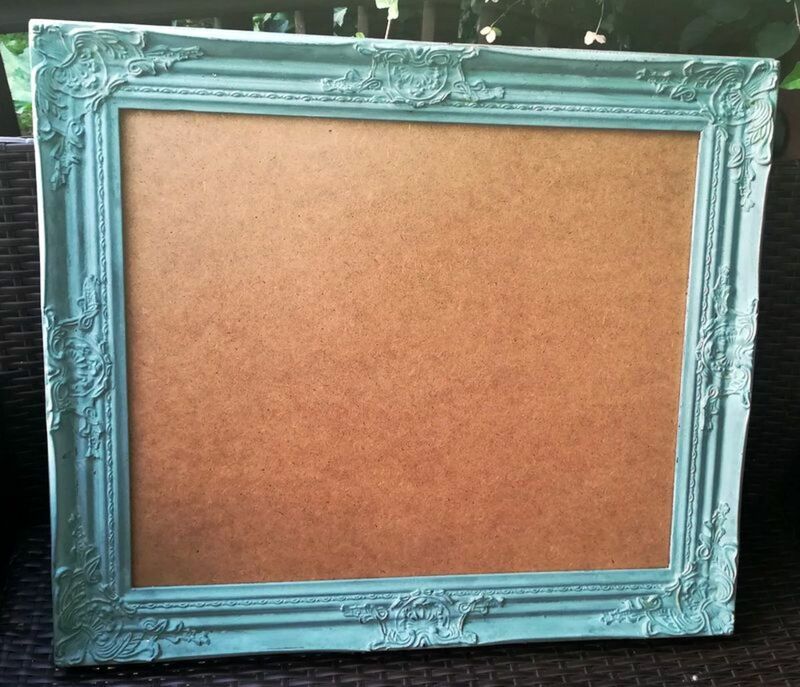 Spray the wood inside the frame with patches of grey, white or silver paint. 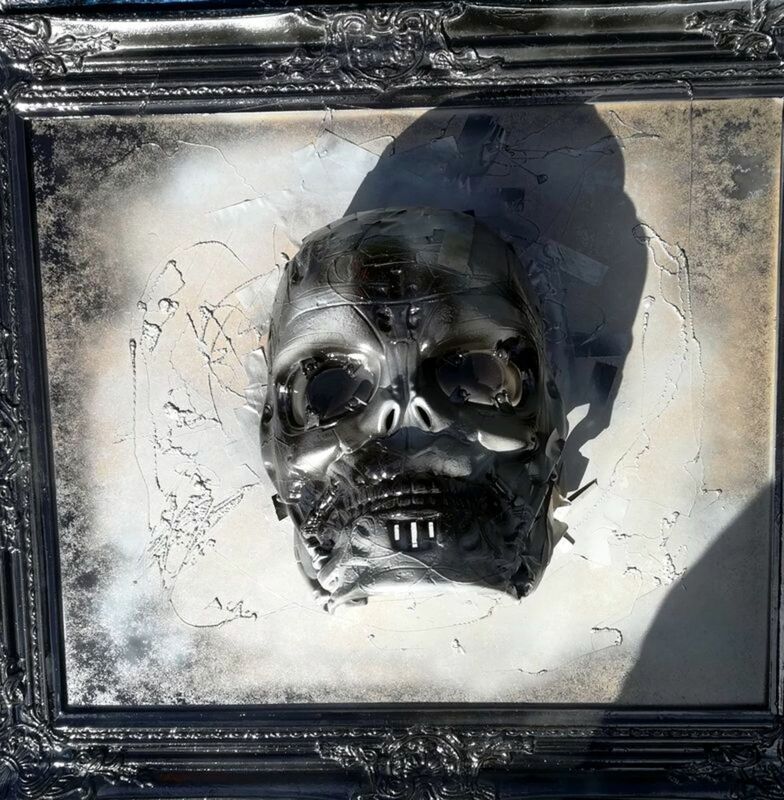 Use silver spray to paint the skull and allow to dry. Give the skull a few coats of paint. The necessary number of coats depends on what it is made of. Unwrap a small piece of cling film and let it scrunch up a little bit in your hand. Using the PVA glue and a brush, stick this onto the wood. Press down hard for about sixty seconds. Continue this way until you have covered the inside wood. To give the cobwebs some depth add some more cling film on top of the first lot in the same way. Use the same brush to add glue onto the surface of all the cling film. Let it dry. This will harden it and give a 3D effect. Using a brush, dab some red paint around the cobwebs. Do the same with some white or silver paint. Add a small amount of red paint to a dish. Pour in a little bit of paint thinner. Mix together with the brush. 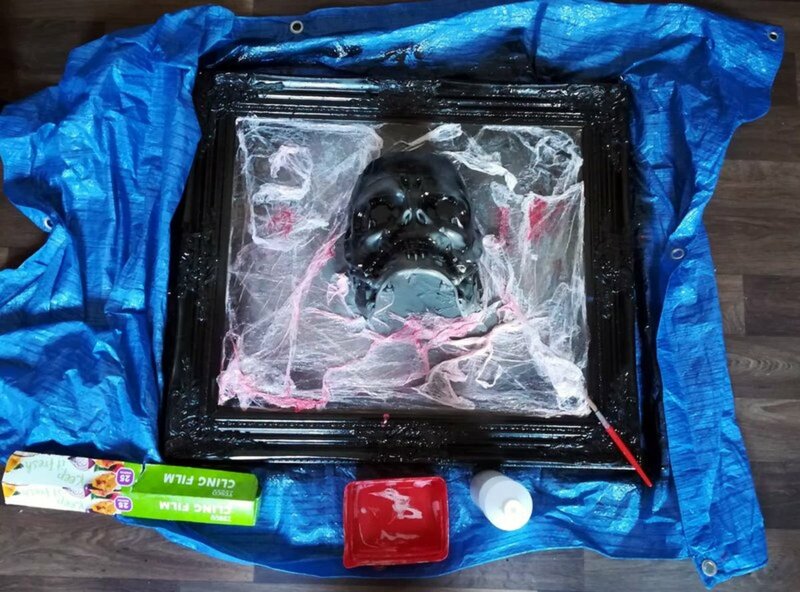 Brush the parts of the cobwebs that are sticking out of the frame with this paint and allow it to drip down. Do the same with white paint on other parts. Spray paint the whole lot back and front with clear varnish. This will protect it from the weather. 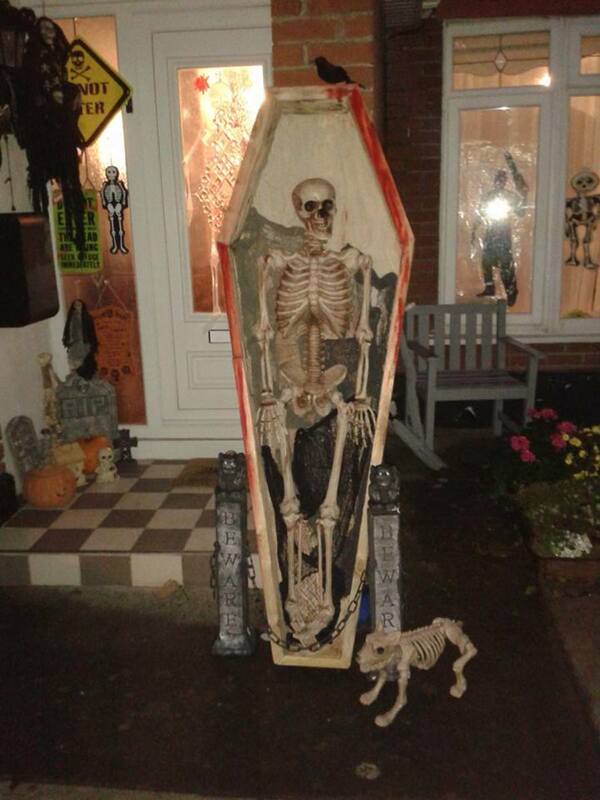 Every year I add to my Halloween display in the front yard. All of them are hand made by myself. They do not cost much money to make either. That is because I go around many thrift shops during the year looking for items for my other craft projects, too. I also have most of the materials needed to make the holiday decorations. But there are certain things I like to buy new. These would be the spray paints and glue. I get both of these cheaply in a shop called Deals here in Ireland. In the US, a dollar store or pound shop in the UK. It is amazing what I can find there. I buy my paint brushes online because they suit any medium I am working with and are great quality. 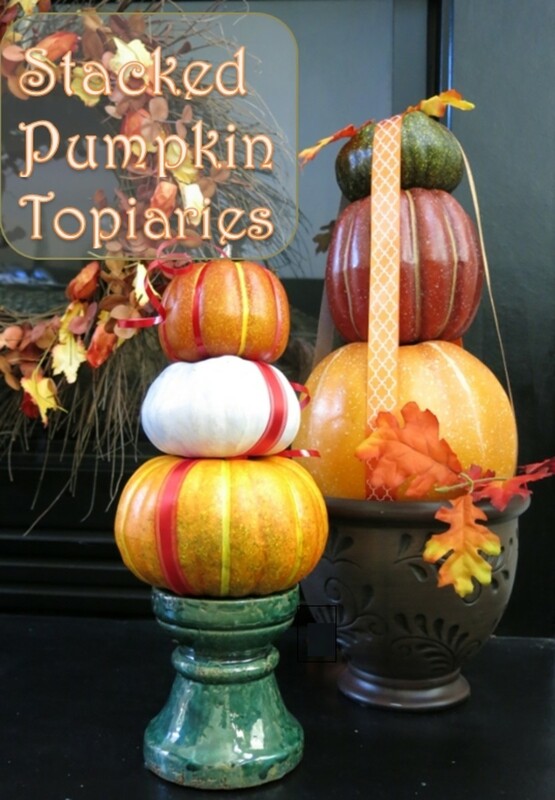 I am a member of a few Halloween groups on Facebook and there are so many ideas on there. 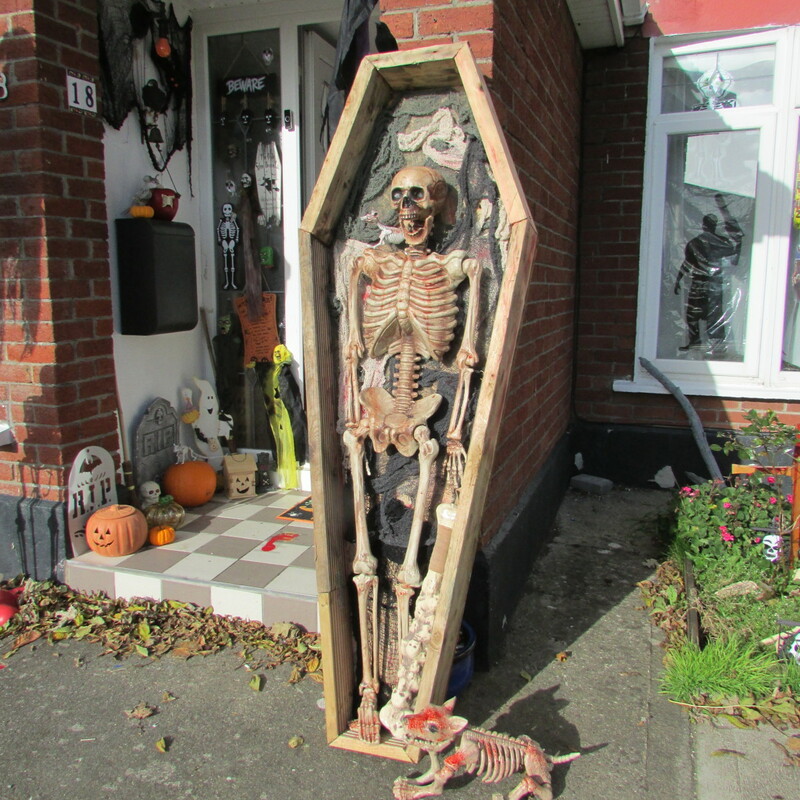 Other projects I have made so far this year are a coffin for my skeleton, a scary snake wreath. And from the horror film IT, there is a Georgie skeleton and his boat. 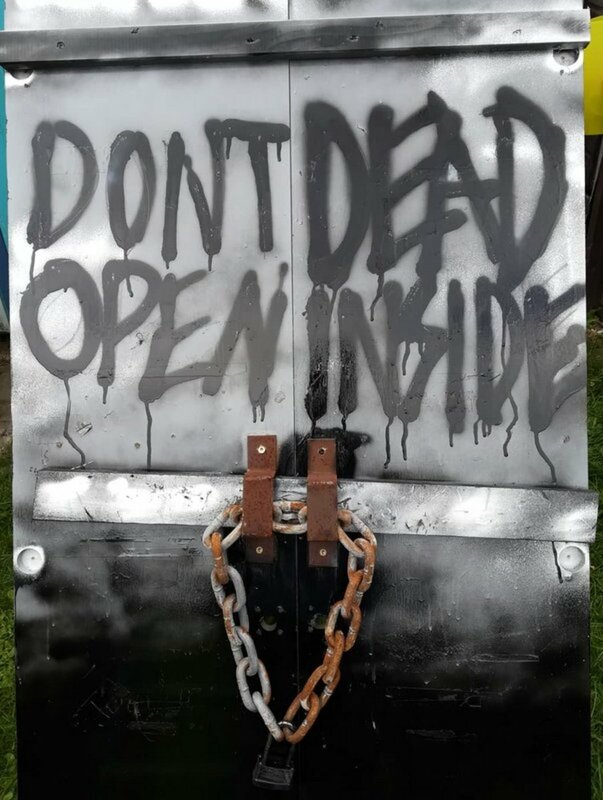 'The Walking Dead' locked door is my favorite though. 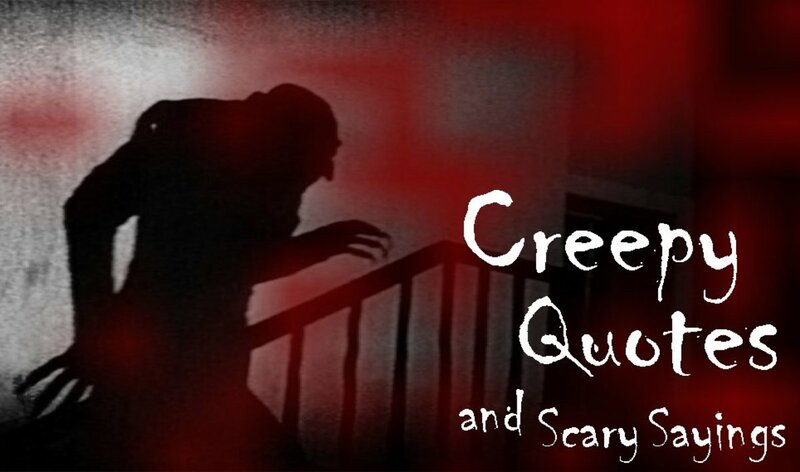 If I put that inside my house, I may scare myself to death every time I walk around during night time! LOL Maybe arranging it outside be a good idea for me. 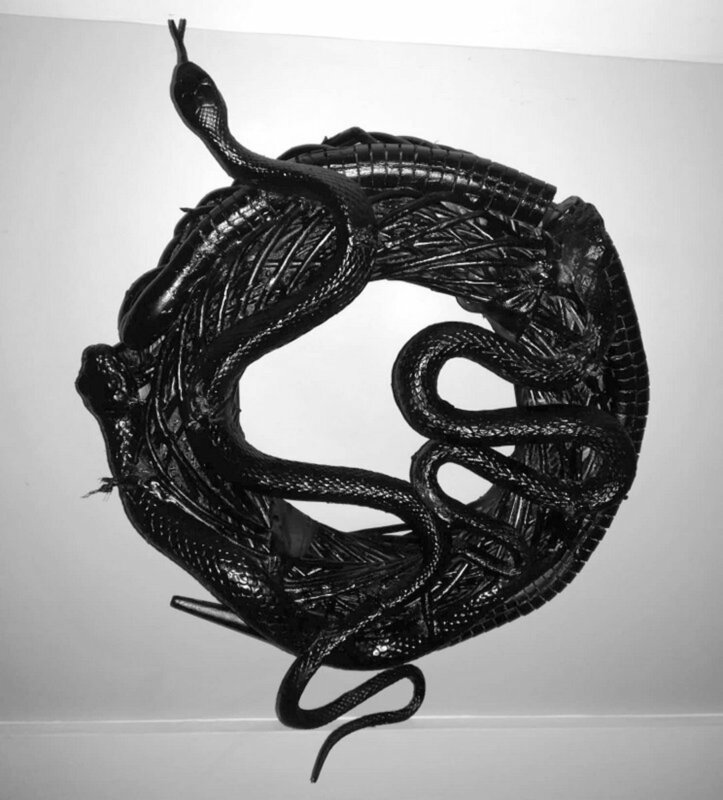 Hello Dred, yes this one was quite easy to make and it does look great either on a wall in the front yard or indoors. 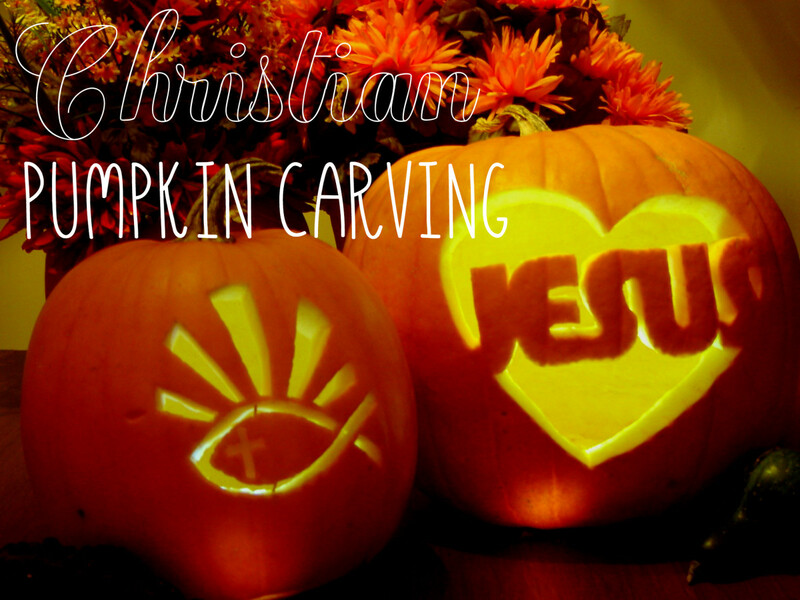 Wonderful idea for this coming Halloween! It looks scary indeed. I definitely consider doing this one as part of my house design. Thanks for sharing!